gucci mane is my life. i need him so bad that i can't not live right i don't want 2b with nobody but him and any body that i do go with they ain't good enough but gucci mane perfect!!!! Jboogie new hit single ''TIP FOR YO DANCE'' for all my single momma's and baby momma's I support ya!!! "Wasted" featured on America's Best Dance Crew on MTV Tonight! "Wasted" will be featured in the first episode of the brand new season of America's Best Dance Crew on MTV. Make sure you tune in! hey im new on here and i love gucci mane he so fine!!! See what critics are saying about The State Vs. Radric Davis! 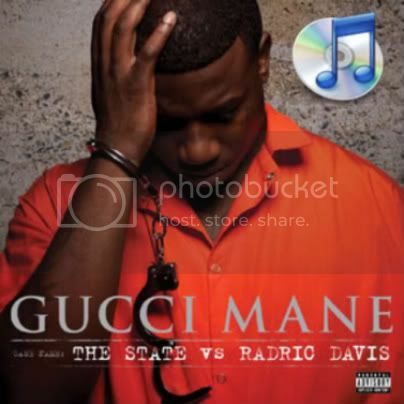 If you haven't already, make sure you pick up The State vs. Radric Davis on iTunes Now and Get Exclusive Bonus Tracks! I was going through my collection of Gucci tapes and found that I have about 20. I'm not sure whether they are official or not, but they are all good. Many of them have the same tracks, but different DJ's. A few mixtapes that I'm feeling at the moment are "Burrprint 3d" and "From Zone 6 To Duval." Both of them have tons of gutta ish by Gucci.